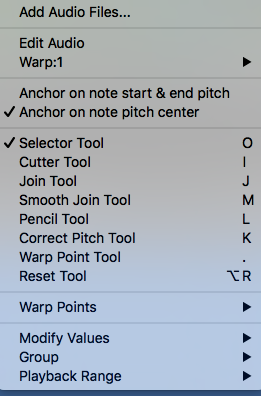 In order to do detailed editing of timing, pitch and level in the Warp Output track, you can RIGHT CLICK in the Output Track to bring up the menu shown right, to see and select the available options (or use the Keyboard Shortcuts shown). For further information on Warp editing is given in Manually adjust timing, pitch and level. While making adjustments to the Output track, pressing the Space Bar will play the rendered audio. You can easily solo the output track(s) you want to hear. To solo the Output on its own - press the A Key. To solo both the Output signal and the Input - press the E key. To solo the Input signal on its own, press the G key. If background processing is turned on, the output audio will be rendered instantly and the Space Bar will play audio. If background processing is off, and a red line still shows above the output track), the APT process needs to be rendered before it can be played. Consult the rendering and background processing preferences for details. Continue to edit the Output audio until you are satisfied with the results. You can use this Output track as an Input to other processes and also, if required, transfer the Output audio to your DAW or a file.